Davis Nursery recently renovated its Madison Indiana location in order to open a Deli in additional to their country market. The southern Indiana grower sells plants, flowers, hanging baskets, vegetables and produce in addition to other homemade salad dressing and local honey. The Davis Nursery’s location in Jeffersonville Indiana has the same country market offerings but this store has also had a Boar’s Head Deli making sandwiches and salads. Business owner Dave Davis felt like the time was right to remodel the Madison store and add the deli. The flat roof on the building had leaked off and on for years especially along the back wall and around pipes and HVAC units. When the store offered only greenhouse items a drip here or there was never really an issue. However the addition of the deli meant that the flat roof had to be repaired not only for the Indiana dept. of health regulations but also for the space need for the new cabinets and sandwich making tables. The leaks had also previously forced employees of the nursery to move inventory and equipment around the wet areas. They were unable to make efficient use of the space because of the flat roof leaks. Business owner Dave Davis reached out to Exterior Pro for an affordable but long-term solution the flat roofing problem. The roofers at Exterior Pro quickly determined that the old roofing was saturated with water and that there was probably going to be several places where the wood sheeting was going to need to be replaced. The wood framed building already had fiberglass batt insulation in the joist cavity, but even so Exterior pro roofing suggested an additional inch of roofing insulation on top of the roof sheeting for added R -value. The entire first day of the project the roofing crew spent tearing off the old saturated roofing material. 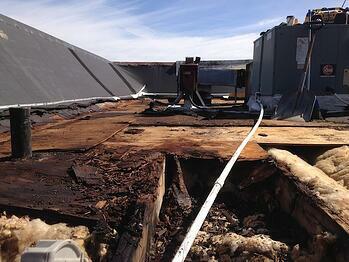 The base layer was tar roofing and then a layer of EPDM rubber roofing had been installed. The Rubber roofing had leaked and had been coated with different types of tars and elastomeric coating over the years. Once the roof was removed the crew could see the water damaged wood. 15 sheets of CDX plywood were required to properly repair building. Wood was the worst around leaking HVAC units and duct work. After the wood was repaired and the new roof insulation was installed the roof was prepped for the new Duro-Last membrane and new flashings. 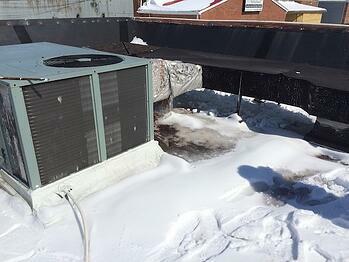 The building owner had chosen White membrane to help reduce summer time cooling cost. After the new Duro last roof was installed and the flashings were on Exterior Pro added a green coping cap to the top of the wall. The old coping cap was beige and just blended in with the rest of the roof metal but the change in color to green helped make the building more noticeable. The grand opening of Davis Nursery was a hit and the new Boar’s head Deli is growing in popularity each week as the Madison Indiana and surrounding communities learn what the Davis Nursery has to offer. 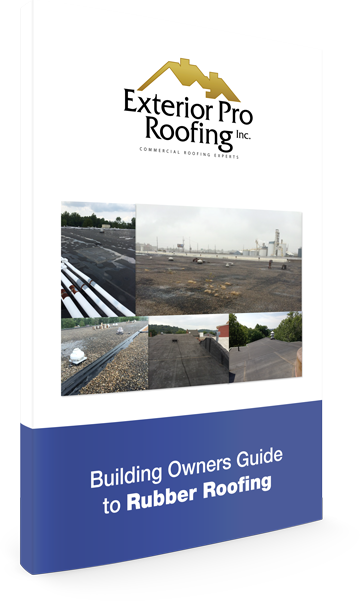 Learn the signs of a leaking rubber roof, how to inspect it and reaplcement and repair options.